Disappointed by Skyline? Tantalized by Castle’s X-Files-y episode this week? Want an alien conspiracy with some meat on its bones (or exoskeleton, as the case may be)? 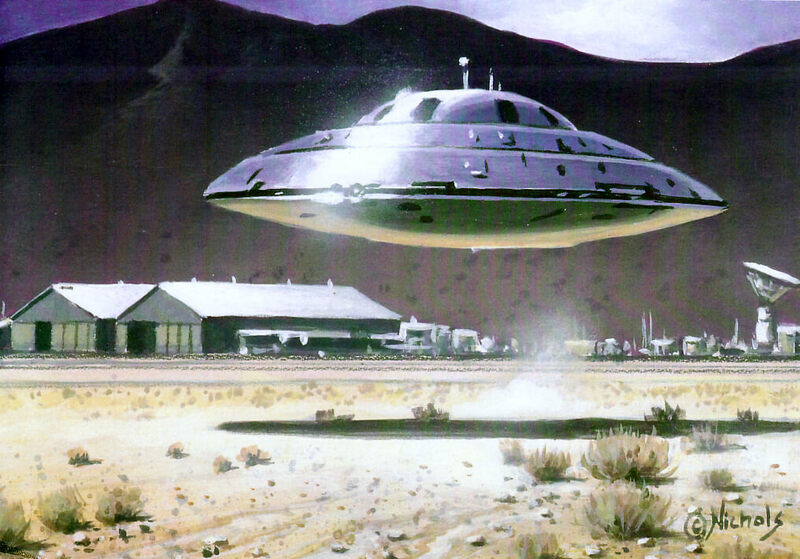 Here are six of the greatest real-life alien conspiracy theories. Actually, “real-life” is kind of a dubious term when talking about this kind of thing. The world of alien conspiracies is an improbably complex and interwoven one. It’s filled with weird personalities, unexplainable events, half-remembered government secrets, and countless races of alien visitors, all with their own agendas. So let’s start with arguably the grand-daddy of UFO conspiracy events: the supposed Roswell UFO incident. In 1947, the Roswell Air Force Base issued a press release saying that they’d found a mysterious metallic disc on a nearby ranch. The press was, of course, intrigued, but the base quickly changed their wording slightly: they’d found what appeared to be the remnants of a weather balloon. The change was not quick enough, of course: the local papers ran giant headlines saying that the air force had recovered a crashed alien spaceship. And in the years since, that story has stuck, as accounts surfaced from employees at the base that include multiple crash sites, massive cover-ups, and even a reported alien autopsy (a film released in 1995 purported to depict the actual autopsy, but it its creator admitted that “most” of the footage was fake, thereby sort of discrediting all of the footage). Die-hards still stand by these scant accounts of fishy dealings at Roswell. The supposed cover-up has permeated public perception of the base, leading to a Star Trek plot, a Futurama episode, and even an entire TV series, among many others. It also launched a veritable squadron of alien conspiracies. Some still believe that the spaceship remnants and alien bodies have been squirreled away in some sort of secret military enclave. And Area 51 might just be that military enclave. The actual base has long been a very closely-guarded secret, including wide “trespassers will be shot” stretches around the base itself and a large no-fly zone surrounding it. According to conspiracy theorists, what we can see of Area 51 is just the tip of the paranoid iceberg. The base allegedly features elaborate underground labs, hidden tunnels, a dedicated extra-terrestrial runway that can disappear and reappear, and research programs dedicated to reverse-engineering alien technology. In one particularly colorful and alluring detail, two different alleged former Area 51 employees reported working side-by-side with an alien being named “J-Rod” on cloning alien viruses and on a telepathic translator device (it’s funnier if you imagine J-Rod as Jar-Jar; I’d watch that movie). And the mystery of Area 51 is still only one example of the vast network of supposed government cover-up of alien contact. The government has been relatively transparent with Project Blue Book. It was an endeavor for the US government to catalog and examine every instance of supposed alien contact, visitation, and spacecraft reported to them. The project spanned years (and many incarnations), and its official result was that there existed no substantial evidence that these incidents were the result of alien visitation. But that didn’t stop conspiracy theorists. In addition to challenging the rigor of the study, some “experts” on the subject stand by the claim that Blue Book became a distraction and cover-up from the reality of alien visitation, which included a top secret international squad called Majestic 12 to perpetrate the elaborate smoke-screen. Among the alleged weaponry of this massive cover-up are disinformation campaigns, character assassination, and elaborate webs of government lies. Another weapon in the cover-up arsenal is the network of supposed Men in Black responsible for doing the actual dirty work. You’ve seen them in Will Smith movies and on the X-Files, but die-hard alien conspiracy theorists claim they’re everywhere, as CIA agents, or as shape-shifting aliens, or even inter-dimensional beings. Some even report encounters with these men in black (like the account in the video above), and some say they have the smashed cameras and bruises to prove it. But WHY would the government try to cover up alien invasions? Just what are they hiding? The cover-up might just be so that world leaders can hide their true reptilian nature. Conspiracy theorist (and very creative thinker) David Icke is the man primarily responsible for the paranoia about secret shape-shifting reptile-like aliens invading Slitheen-style and replacing high-ranking political leaders. There are countless videos and images all over the internet purporting to depict these reptilians slipping and revealing their true selves. One of my favorite details about Icke’s worldview is that of the Red Dresses. These are personality-less software constructs of the reptilian invaders installed at high rank to facilitate the aliens’ plans. This particular theory is what leads to stunning images like the one above, which reveals a few of the “red dresses” in their true form. Another proponent of this reptilian-invasion worldview recently gained a bit of notoriety when discussing her own version of the conspiracy. Her name is Colleen Thomas, and she wants to warn us all of the impending shadow-government dirty bombing and a Draconian-Reptilian invasion. These reptilian usurpers and shape-shifters are supposed to have been around for millennia, manipulating all of human history for their own gain. But Icke and his reptilian cronies aren’t the first to propose alien invasions in ancient history. As long as we’re talking about extraterrestrials secretly influencing human history, we have to talk about the “ancient astronauts.” Erich von Däniken, in his landmark (in certain circles) book, Chariots of the Gods?, posits that Earth has been the frequent recipient of alien visitors. These visitors have brought with them advanced technologies, some of which helped build the pyramids, the Moai statues on Easter Island, Stonehenge, and more. Many religions have developed as a response to this particular conspiracy, and we’ve covered some of the most absurd ones before. Hidden histories like this tend to have religious implications. But, as the next item demonstrates, they sometimes have unexpected political implications. As with any internet discussion, it all eventually turns to a discussion of Nazism. And alien conspiracy theories are no exception, with my favorite of the weird extraterrestrial conspiracies, Esoteric Hitlerism. Spearheaded by Miguel Serrano, Esoteric Hitlerists believe that the Aryan race is descended from an alien species of the highest order. Finding evidence in the story of the Nephilim in the bible, Serrano believes that an ancient alien civilization came to Earth to enlighten man. They bred with ancient earthlings, and the Aryan race are the only race alive that maintains any of the purity in their blood of these lofty ancestors. Serrano taught that the alien gods were hiding, with Adolf Hitler, in an icy underground fortress, from which they will one day emerge with fleets of spacecraft to usher in the Fourth Reich. So if you are disappointed by a fictional portrayal of the secret alien interactions with humanity, you can always fall back on the real things that people believe. Sometimes, especially in the case of Esoteric Hitlerism, not only is the truth stranger than fiction – some people’s version of the truth is just too strange for fiction.